What Does A Bad Player Call With Preflop? This begins a complete series all about hand reading. We’ll dissect an entire hand history and assign a fish’s range on every street. If this is your first time doing this, this may seem complex and severely confusing. You are not alone. But this process gets easier with practice and eventually becomes a skill you can do in real-time while actually playing! Now, this is not going to be the easiest stuff in the world, but this is the kind of stuff that when you work through it, yes, it’s complicated at first, but it becomes easier over time and this is stuff that you can use in real-time. You can use these hand-reading skills to figure out where people are at in real-time, and then you can choose the best lines to exploit them in their exact ranges at that moment. and take a very technical viewpoint of this exact spot. This exact situation won’t come up on a ton of the time in your game, but if you can take the process and framework, apply it to your own off-table study, and work through it – you can actually use these skills in real-time. Let’s get started by going through hand 15. 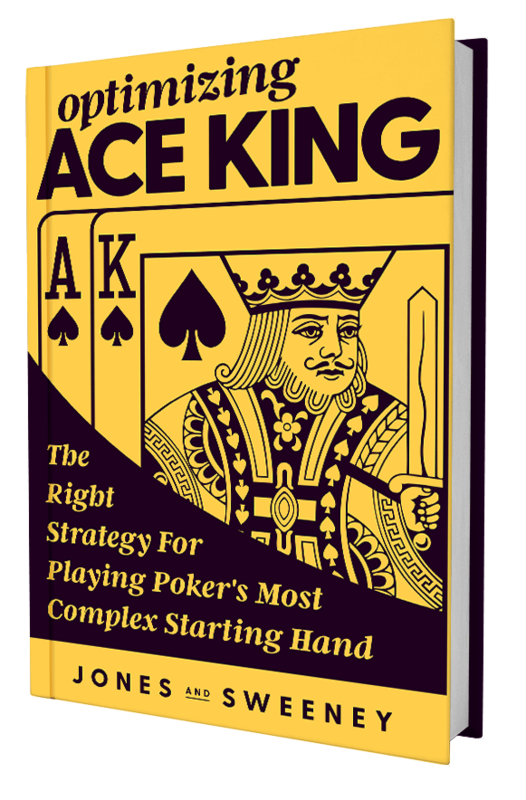 This is from the Live Poker Player’s Hand Reading Workbook, Volume 1. We’ll also use our good old, trusty Flopzilla, which I love using. You can use other pieces of software for this kind of analysis, but I’m just going to use Flopzilla because I love it and I’m very used to it. And then we have the template. Hand 15 is from the section 2, so we’re going to use the section 2 template, which focuses on our opponents’ ranges. Let’s start with the description for hand 15. This, of course, being from the Live Workbook is from live 1/2. There’s been a lot of action at this table. Everyone seems to be on tilt and the chips are flying left and right. Sweet. Sounds like a pretty good table to be at. The cut-off has been predictable to this point and the SB has been the exact opposite. The SB is described as someone who never folds, not too shocking, and the BB has not squeezed at all so far. They’re described as a nit. Again, not too shocking. In this workbook, we actually start by analyzing the cut-off’s range. But we’re just going to skip right to the SB’s range. So in this spot, the cut-off opens 10. We call on the button with J9s and the SB calls as well. So let’s start by building the range that they would call with here. In the note section of the template, we’re just going to say SB equals never folding opponent. For me, that just means that this person is probably super-fishy, not too aggro, and, of course, I’m getting that from the fact they have not been 3betting much. That’s leading me to believe they’re not too aggressive, at least not preflop. I’m going to build my ranges based upon that information. Do you play against players like this all of the time? Use these 5 tips to make these soft players every more profitable for you! The major reason why you want to take this kind of note when you’re doing this stuff on your own is so that when you go and review it later, you can understand exactly what your assumptions were. Sometimes your assumptions will be incorrect, sometimes they’re going to be spot-on, but at least if you know exactly what your assumptions were, you don’t have to guess later down the line. Let’s start by building their preflop range first. In this situation, one of the first things I think about is what would they have 3bet? Because if you think about their range here when they’re facing that $10 open, they can fold, they can call, and they can 3bet. Each of those kind of gets its own separate, little bucket. Of course, in this situation, we’re only going to focus on the call bucket. But I still like to know what the fold bucket looks like and what 3bet bucket looks like. That helps me visualize their entire range as a whole. It also helps me understand which hands are not in that call bucket. If they would have folded, say, 72o, I don’t have to worry about them flopping 2pair very often on a board of 7,3,2. So keep that kind of stuff in mind. Of course, same thing with the 3bet stuff, which is why this prompting question here is do you think they would 3bet or call with AQ, TTs or KQs? Start by opening Flopzilla and building what we think they would call with preflop. Because the SB is described as someone who never folds, I’m going to assign a very, very wide range preflop. Now, that’s not going to be true for every single person of course, but for this person, yeah, I think that’s probably going to be pretty fair. And so they will have a pretty darn wide range, at least in my opinion. Someone who I think never folds, I think is going to be calling here at least half the time. If not, more. Let’s be honest, this is live. They have some money in front of them, so I think they’re going to gamble a bit more. Just in general they don’t fold, but, of course, they haven’t been 3betting too much, so I think they’re going to call a lot of the time. I’m going to start by dragging this to something like 60% and start from there. Right here, we’re at 62%. I’m going to take off the hands that I think they would 3bet for sure, which is QQ+/AK then start hacking away from there. So you notice some of the prompting questions are kind of those hands that for some players would be under the cusp. Do we think they’re going to 3bet or call with AQ? Well, I think someone who’s not 3betting a ton of the time, someone who is described as someone who never folds, is probably more likely to flat it than to 3bet it. Now, of course, if I’ve seen them 3bet AQ in the past, of course I’m going to assume they’re going to 3bet at least some percentage of the time here, but for this kind of person, again, based upon the player description and exactly the assumptions I’m making, I’m thinking those are getting flatted. I think JJs probably gets 3bet, but TTs probably gets flatted. KTs I think probably gets flatted as well. So, again, I think they’re flatting the pocket pairs that aren’t premium. I think they’re going to be flatting the broadways that are not premium. And then, of course, lots and lots of other stuff. I think this is probably a fair starting point to be honest. I think probably all kings are in there, probably things like this, those double gappers, probably 43 off, probably 53 off. I think this is probably pretty fair. And you notice this drags us up to 67%. I actually have to add in the dead cards because we have J9. Perfect. I just added that in over on the right of Flopzilla just off screen. We’re just going to rock and roll and start from here. What we have here is two thirds, so 67%. Number of combos? We can see right here at 816. And what is their preflop range? If you’ve never done this before and worked with Flopzilla, there’s a cool little shortcut with your keys that you can use to make life a lot easier. So if you use control/Alt/T, you get the entire range that you can just very quickly copy, past it in here, and you’re good to go. You may be wondering why the heck you want to do this being that this isn’t the most readable thing for a human, right? The major reason is, is because if you analyze this hand later, it’s actually very easy to come in here, import the range, and then just paste it in. Then you’re ready to rock and roll and get started and go from there. Again, When we’re building this preflop range, a couple of major things we need to keep in mind. One, what are they going to 3bet? In this situation, I made the assumption that they’re going to bet JJ+ and AK. Now, maybe you disagree and that’s totally okay. And, of course, for other player types, I’m massively going to disagree with this. I think other player types are going to 3bet very, very differently. But for someone who’s described as someone who never folds, who I’m assuming is a little bit more on the passive, spewy fish side of the spectrum, this is the range I’m going to assign. One, what are they going to 3bet? In this situation, I made the assumption that they’re going to bet JJ+ and AK. Now, maybe you disagree and that’s totally okay. And, of course, for other player types, I’m massively going to disagree with this. I think other player types are going to 3bet very, very differently. But for someone who’s described as someone who never folds, who I’m assuming is a little bit more on the passive, spewy fish side of the spectrum, this is the range I’m going to assign. Secondly, you have to remember is that once you assign a preflop range, it’s kind of set in stone. What I mean by that is you don’t come back in here later when the flop is 10,4,3 and say, “Hmm, I don’t know. Maybe they have T4o here.” If they didn’t have a preflop, they can’t magically have a postflop, so keep that in mind. Be very, very diligent with your preflop range assignments. If you have to assign a little bit wider preflop for someone who is a little bit more crazy like this dude, that’s totally fine. Again, maybe you think 77 is even a little bit tight for this specific opponent. That’s okay, too. If you want to get this range or you think this range is realistically closer to 80%, okay, cool. No stress at all. Just fill in the template accordingly and then carry that range as you go into the flop. So, again, what do they 3bet, what do they call with? Understanding all buckets. In this situation, we can actually visualize the entire bucket. This is all the possible hands they could have preflop. All the hands that are currently selected, these are hands that we think they’re calling with. All the hands that are deselected up here, we thought they would 3bet with. All of these deselected hands over in the garbage sections are hands we think they would fold with. So now we can visualize their entire range. We understand that preflop they give action, give or take around 70% of the time. We understand what that looks like in combo form. Now, of course, that’s huge in terms of combo form, but it’s good for us to at least know that and get started as a starting point when it comes to then going in at postflop and building flop, turn and river ranges. So that’s going to wrap it up for this video. Again, we’re just going to focus street-by-street. Each video is going to be its own street. So come back for part 2. We’re going to start dealing with the flop. And just a quick hint, we do end up flopping trips, but the board is also very special, we face some weird action, and we have to make some pretty big decisions come the river..